Last term’s GI United Nations S. hero World Approval stalked the pace from the outside and made a strong bid in the stretch to capture his second win at the highest level in Saturday’s GI Fourstardave H. at the Spa. 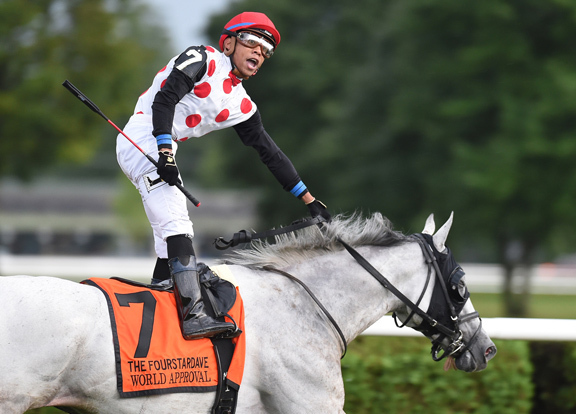 The gray failed to find the mark in his next three starts, including a close third as the 5-2 favorite in the GI Northern Dancer S. at Woodbine last September, before starting his 5-year-old season with victories in the Florida-bred Turf Classic S. Apr. 2 at Tampa and GII Longines Dixie S. May 20 at Pimlico. Fifth going 1 1/4 miles in the GI Woodford Reserve Manhattan S. last out June 10 at Belmont, the homebred was given a 53-10 chance on this turnback to a mile. With the ground having plenty of give to it after a heavy shower hit the upstate New York area late in the afternoon, World Approval set up shop in third behind easy opening splits over the yielding going in :24.64 and :49.86. He launched a three-wide bid at the quarter pole and turned it on nicely down the stretch to win going away. World Approval is the latest success story for his dam Win Approval, whose best produce was Miesque’s Approval (Miesque’s Son), the 2006 GI Breeders’ Cup Mile hero and that year’s Eclipse Award-winning turf male and now a sire in South Africa. Win Approval’s other seven-figure earners include Revved Up (Sultry Song) and Za Approval (Ghostzapper). World Approval’s half-sister Highest Approval (High Fly) is the dam of MGSP Roman Approval (Roman Ruler). World Approval is the final listed produce for his dam, who was barren to Northern Afleet in 2013. FOURSTARDAVE H.-GI, $500,000, SAR, 8-12, 3yo/up, 1mT, 1:37.65, yl. O-Live Oak Plantation; B-Live Oak Stud (FL); T-Mark E. Casse; J-Manuel Franco. $300,000. Lifetime Record: 22-9-2-4, $1,443,763. Werk Nick Rating: A++. Click for the eNicks report & 5-cross pedigree. *1/2 to Revved Up (Sultry Song), MGSW, $2,648,879; Miesque’s Approval (Miesque’s Son), GISW, $2,648,879; Za Approval (Ghostzapper), MGSW & MGISP, $1,394,666. 2–Time Test (GB), 120, h, 5, Dubawi (Ire)–Passage of Time (GB), by Dansili (GB). O-Juddmonte Farms, Inc.; B-Juddmonte Farms Ltd (GB); T-Chad C. Brown. $100,000. 3–Ballagh Rocks, 119, c, 4, Stormy Atlantic–Bells Are Ringing, by Sadler’s Wells. ($70,000 Ylg ’14 KEESEP). O-Donegal Racing; B-Turner Breeders, LLC (KY); T-William I. Mott. $50,000. Margins: 2 1/4, 1, 5HF. Odds: 5.30, 2.05, 6.20. Also Ran: Disco Partner, Sassy Little Lila, American Patriot. Scratched: Weekend Hideaway.